So do you favor the Lions going offensive or defensive line? Any particular player you want or don't want? I'm not so sure that we are relinquished to drafting OLine or Dline at #13? With that said, if it came down to it, I think the Dline talent, far out weighs the Oline talent this year. So I would lean towards grabbing one of the DE guys before taking a chance on one of the Olineman. I guess it depends on how far down the board we get on the Dlineman too. I'm totally for drafting BPA, of course I would cringe if we took a RB or WR at 13, but I would also understand the reasoning behind it. I am usually in favor of a trade down. But, given this years draft class, I am in favor of a trade UP. I want to see us go up for either Peterson, ( he has been compared to Charles Woodson), or Amukamara. I view this draft as having MAYBE 10 players that would have a 1st round grade in any other draft. The rest would carry a 2nd or 3rd round grade in any other draft all the way through to about halfway through the 4th round. After that, there is nothing worth having. I would love to see Mayhew trade up to #8 to get ahead of Dallas and take Amukamara. It would probably cost our 3rd to do this. Then we take either Mason Foster or Bruce Carter in the 2nd round. Then I would trade as many of our remaining picks as possible for future picks. We would get 2 starters out of this draft. And that's the best that any team could hope for out of this draft. And we set ourselves up nicely for next years draft which is bound to be better in talent. Any OL at 13 is a reach IMO. Only 5 DL I like at 13, the two DTs along with Bowers, Quinn and Jordan. After that I'm after someone like Julio Jones. If I had to take one of the two I'd probably go O-Line. But that being said, if an opportunity to trade down into the high teens or low twenties, I would take that in a heartbeat. If Tyron Smith is available, and no trade offer came, then I'd probably take him. The amount of D-Line talent might make a team want to jump up and take one at our spot. If Julio Jones is gone before then, St. Louis will probably take a DL, making our spot attractive to some teams. If we could move down we could take Martez Wilson and gather picks to try to get a 2nd 2. I like the depth in the second round, Curtis Brown, Ras-I Dowling, Mason Foster. Depending on what happens with the CBA and potential free agent signings, the trade down scenario could make the Lions a formidable defense. 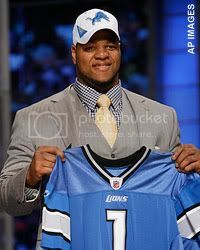 Dream scenario: FA happens and the Lions re-sign Houston and sign Stephen Tulloch. Trade down and draft Wilson in the first, Brown and Dowling in the second. Boom. I don't want us to go OT in the first but if it falls that way, I wouldn't hate Tryon Smith. He can take some time to learn, possibly fill in at RT (depending on Gos' recovery) and then move to the left side next year when Backus' contract is up. As far as DE's I think Cameron Jordan, Ryan Kerrigan, Aldon Smith and JJ Watt should be available. Jordan and Watt might be better suited for the 3-4 but I think either could still be good 4-3 ends. I don't know how I feel about Smith but I like Kerrigan and Jordan the best, followed by Watt. Obviously it'd be awesome if Quinn fell to us but I see that as about as likely as Peterson or Amukamara being there. If the Lions can't trade down from 13, I'd be happy with a DE since he most likely would be the BPA at that point. Besides, KVB is getting up there in years and Avril could shortly leave via free agency, so DE will become a need in the near future. As for OT, it certainly is or will be a need, but I just don't see the talent there in this draft as there is at DE. Depending on which d-lineman is there, but Id say D-Line in a heartbeat, especially DE. Ill probably get shot for saying this, but still to this day I like Carimi more than any other OT in this class, and would probably be the only one not mad if we took him at 13, which of course will never happen. I really like Watt and think we'd have a chance at him at 13. So if it came down to only being able to take an O or D lineman, Id cross my fingers for Watt. I agree with the majority here that D-line would be my preference. I like Watt, he can play in any front. Also like Aldon Smith, he's only 20 years old and still growing, like the potential. That's my take, but the thing is I've seen both these guys listed higher and lower than our selection depending on what big board your looking at. 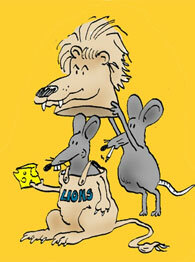 The only board that matters is the Lions. How many of these players listed in the top 20, on big boards, at draft sites that I look at, fit what we do? I would think the Lions have 2 boards, one showing a consensus of the top talent in the draft, and one showing who they think, best fits their scheme. Drafting scheme specific, just makes good sense, and I'm sure many teams approach it that way. There could be several players currently considered top 10 on many of the boards found online, that will fall on d-day. Hope so. Enhances the chances of trading back by increasing the value of our pick. This draft is unlike any other we've experienced because of the lockout and the lack of FA at this point. It's going to be interesting to see how things proceed because teams won't be able to fill holes with FA's perhaps causing them to make "need" picks instead of "BPA" picks. Right now, the D-line is something that we can hang our hats on. There needs to be an eventual successor for KVB, but at least there is a consensus starting group. Not having anything at CB or LB scares me. IMO filling holes is more important then finding an eventual starter at DE. This draft is filled with good DL, so the BPA approach might be a good idea in a typical year, but maybe not this year. I'm not sure what teams are going to do in this regard, but it is something to keep an eye on. If FA doesn't open up until mid August or September, how is that going to affect what goes down on D-Day? Teams are going to have rosters with holes, and if this labor impasse shows no signs of abating before the draft, it could make things very interesting. While I understand your point of view, I have to disagree. I think teams will stick to their typical draft strategies for one very big reason: Free Agency will eventually take place prior to the start of a season. Teams will have an opportunity to fill their roster holes, and don't HAVE to do it in the draft. And aside from that, depending on what's agreed to in the new CBA, teams may suddenly have players that they thought would still be on the roster that suddenly become free agents. Image in the Lions case that Cliff Avril is suddenly deemed an unrestricted free agent rather than a restricted. Our defensive end position would be somewhat shaky at that point if he signs with another team. Turk McBride is already a UFA, so we'd have just LoJack and KVB. I'd prefer the Lions go BPA, regardless of what happens between now and the draft. If the best player on their board is a OT, take him. If the best player is a DE, take him. Anything but a QB. I think BPA teams will stick to it, but what is going to be different is that some teams fill major holes in the offseason which won't have happened by the draft this year. Some teams don't draft BPA, they go for biggest need and that could alter the draft due to teams still having holes and no assurance to fill them. LB, CB, RB or WR. I am with you on Carimi and Watt. At this point Watt is my choice unless Miller, Amukamura or Petersen is available (not likely).